Welcome to my website. E komo mai! 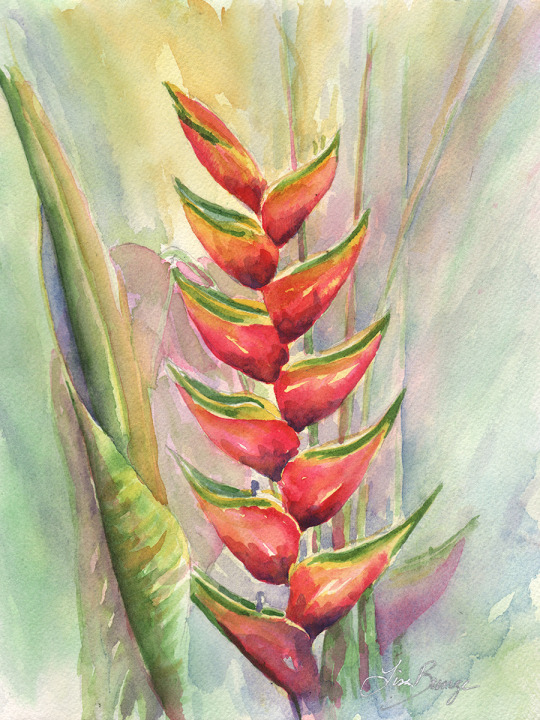 I love to paint, and I love to share my knowledge and appreciation of the Hawaiian landscape, its unique flora and fauna, and rich cultural history with one and all. These are my tropical dreams . . . made with paint brush in hand. Hawaii is a special place, and I consider myself privileged to be able to live here and share it with others. This website is a way of sharing my paintings with the world. You will find a selection of my work below in the PORTFOLIO section of the site. Some of these paintings are still available as originals, and most are available as high quality limited edition giclee prints. Some are also available as open edition fine art prints. More details can be found in the PURCHASE section of the site. 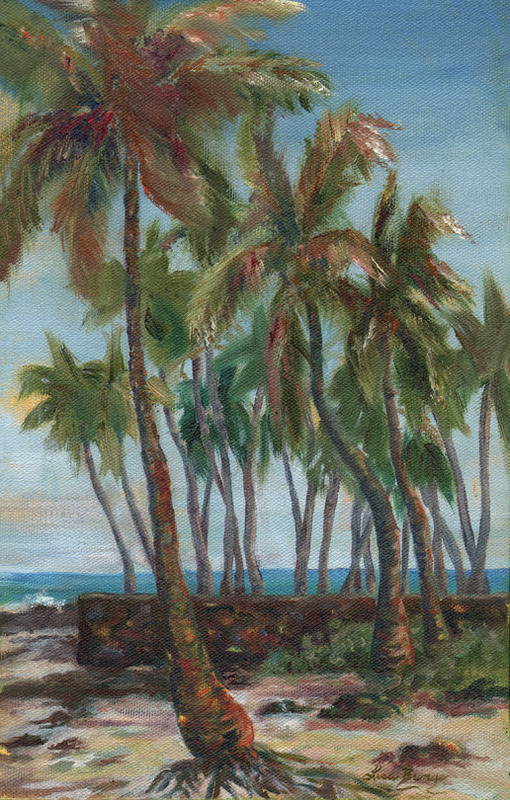 My paintings and prints are available for purchase directly from me, and are also featured in a number of finer galleries on the Big Island of Hawaii. A limited selection of prints are also available through the Fine Art America website. Please visit the PURCHASE section of the site for complete information about how you can own your own originals or high quality reproductions. If you'd like to drop me a line, you can send me an email by clicking CONTACT in the menu above. I'd love to hear from you. Lisa's original paintings and limited edition giclee prints on canvas and paper are available at numerous Big Island galleries. Selected open edition prints are offered for sale via the online marketplace at Fine Art America.com for direct fulfillment via their site. Lisa offers select originals and giclees for sale directly. Please contact her via phone or email for information about size, price and availability. 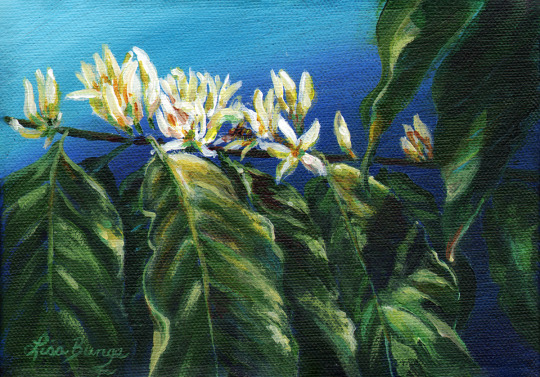 A Kailua Kona resident since 1984, artist Lisa Bunge invites you to enjoy her unique renditions of old Hawaii, it’s proud people, historical landmarks and tropical flora and fauna. 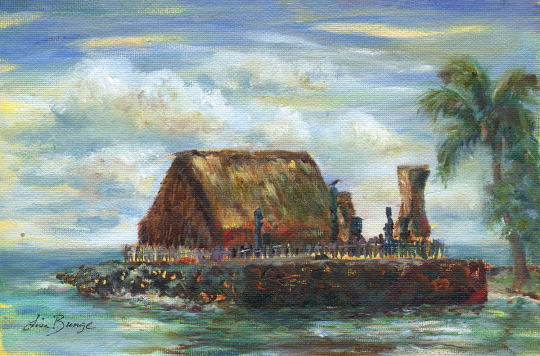 Painting scenes of old Hawaii often gives Lisa the chance to meet many of the people whose lives are associated with the scenes, providing her with a rare glimpse and understanding of the days gone by as well as the true aloha spirit of many of Hawaii’s long-time residents. Her paintings reflect that same sense of spirit to the viewer. Having spent many years working on and around the ocean, she became especially inspired to capture the grace and beauty of Hawaii’s sea creatures. The honu (turtle) is one of her favorite subjects. Painting since she was a young child, Bunge has developed her talents by working with a wide variety of teachers and techniques. Commissioned works are available; Lisa welcomes the opportunity to create a one of a kind piece of art just for you with your choice of size, medium, color and subject matter! Since we are well past halfway in 2015, I’d like to share a few of the things I’ve been up to since last report. It’s been a busy year for me, as I have been painting away in my studio, as well as en plein air. The Kona/Kohala coast is a boundless source of inspiration for the artist, and I feel privileged to have this special place as my open air studio and model. Always there, at my beck and call, what more can an artist ask for? I’ve painted a significant portion of this island landscape, but I’m still making new discoveries. If you have a special place I haven’t yet painted, I’m open to commissions, too. 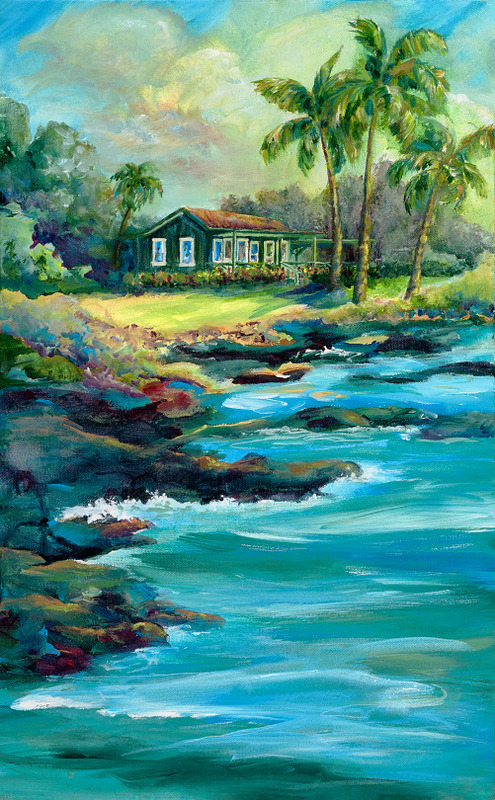 This is my most recent painting, the iconic Eva Parker Woods Cottage at the Mauna Lani, on the Kohala Coast. This historic home sits on the even older Kalahuipua'a fish ponds, and is a modern day survivor that embodies classic Hawaiiana in it’s purest, most idyllic form. Who, at times, doesn’t imagine themselves leisurely taking in the view from their oceanfront lanai in a bygone era? Here are a few others from this year. Stay in touch. I’d love to hear from you, from near or far. Please use the contact form below to send me a direct message. I encourage you to send general comments (I'd love to hear them), ask purchasing questions about any of my artwork, or inquire about commissioned work. You may also reach me by phone at 808.938.3563. Your message was successfully sent. I will be back in touch as soon as possible.